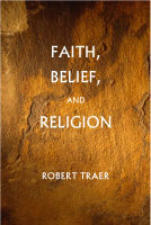 Title: Faith, Belief, and Religion Author: Robert Traer A PenMark Press Book soft cover 194 pp. USD 20.00 ISBN 978-1888570649 April 2001 The Davies Group, Publishers Dr. Traer begins his book with two examples of how scholars talk about religion, belief, and faith in order to see our choices more clearly. He follows with an examination of the historical development of these key words and and considers the implications of changes in their meanings over time. The book then explores understandings of faith in the Buddhist, Christian, Hindu, Jewish and Muslim traditions in order to demonstrate that the personal language of faith allows us to see not only the diversity of these religious traditions, but also what they have in common. Finally, he suggests that speaking personally about religion, faith and belief may help us in choosing how to live our lives more faithfully. Contents Preface Chapter One — Choices Exploring Religion; Religion Alive; Religion and Faith Chapter Two — Religion History of “Religion”; Modern Conception; Other Religious Traditions; Diversity; Choices Chapter Three — Belief Believing; Better Beliefs Chapter Four — Faith In English; New Testament Parable; Secular Faith Chapter Five — Hindu Faith Sraddha; Believing; That Thou Art; Gandhi; Being Chapter Six — Buddhist Faith Attitude; Act; Gift; Saving; Ordinary Life Chapter Seven — Jewish Faith Covenant People; Jesus of Nazareth; Jewish Scripture; Hasidic Examples;Judgment; New Israel Chapter Eight — Christian Faith New Testament; Paul; Synoptic Gospels; Gospel of John; Doctrine;Communities of Faith Chapter Nine — Muslim Faith Imam; Knowing the Truth; Creed; Religions; El-Hajj Malik El-Shabazz; Common Living Chapter Ten — Choosing Our Language; Shared Inquiry; Living Truth Notes Reviews “…lively, intelligent and accessible […] moves us away from religion as a set of doctrines or institutions into a sense of the personal, experiential and practical. The book should have wide appeal.” — Robert N. Bellah (co-author of Habits of the Heart and The Good Society) “…appealing and lucid […] gives both epistemological precision and spiritual depth to the words ‘belief’ and ‘faith’ […] [his] accurate and sensitive exploration of ‘faith’ in a wide range of religious traditions makes this an admirable teaching tool or basis for group discussion.” — Dr. John B. Taylor (formerly Secretary General of the World Conference on Religion and Peace/International). “… unique in its genre […] a remarkable contribution to those who are struggling to make sense of living faithfully in a religiously plural world.” — S. Wesley Ariarajah (Professor of Ecumenical Theology, Drew University School of Theology) Author Dr. Robert Traer (PhD, Graduate Theological Union, Berkeley; DMn, University of Chicago Divinity School) served as executive director of the International Association for Religious Freedom from 1990-2000 and represented the work of the IARF on religious freedom at the United Nations. (The IARF is an interfaith organization involving Buddhists, Christians, Hindus, Jews, Muslims, Sikhs, Shinto priests, members of indigenous traditions, Unitarians and Universalists.) In 2002 Dr. Traer was a Resident Scholar at the Tantur Ecumenical Institute for Theological Studies in Israel, and in the spring of 2005 he served with the World Council of Churches’ Ecumenical Accompaniment Program in Palestine and Israel. He is a retired minister in the Presbyterian Church (USA). Dr. Traer has taught courses on ethics and religion at the Dominican University of California in San Rafael. He is the author of Doing Environmental Ethics, Faith in Human Rights, Quest for Truth: Critical Reflections on Interfaith Cooperation, and Jerusalem Journal: Finding Hope. Many of his writings are available online at http://christian-bible.com, http://religionhumanrights.net, and http://doingethics.com.